Have you ever wanted to repay a friend for their kindness by giving them something in return? I often try to make an effort to remember my friends’ birthdays without checking Facebook and send them some kind of gift, even if it’s just a birthday greeting or a nice picture. There are many ways to show your friends gratitude for the things they’ve done for you. First, figure out your love language and then figure out which love language your friends would respond to the most. It’ll definitely help when it comes time to get them a present! 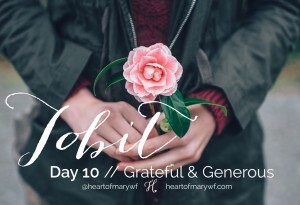 Raphael chooses to show his gratitude to Tobias and Tobit by giving them some advice. He reminds them to give gratitude to God, to keep doing good, especially through prayer and fasting, and to be generous through almsgiving.